Artificial intelligence, the ability of computers to spot patterns in large volumes of data, has advanced so rapidly that researchers promise self-driving cars and medical diagnoses from facial scans soon. The ascent of AI into the domain of human exceptionality has prompted as much anxiety as hope. Science fiction is littered with stories of AI, programmed to protect human life, becoming sentient and murderous. 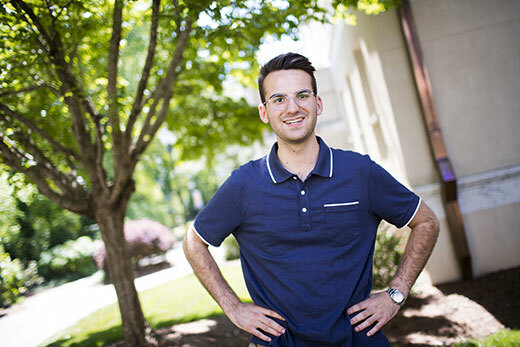 Ben Goldfein, a senior in Emory College of Arts and Sciences, argues in his philosophy honors thesis that the answer to this modern angst lies in Aristotle’s ancient Nicomachean Ethics, which describe moral action as doing the right thing to the right thing at the right time, toward the right end and in the right way. Aristotle’s virtuous ethics eliminate a constant right answer, forcing the best possible answer in a given situation. Such consideration would turn AI far more like us than something like Amazon’s Alexa — and expand what it means to be human in the ever-shifting technological landscape. He will continue to explore these questions after graduation as he pursues a master of letters in moral, political and legal philosophy through the Robert T. Jones Jr. Fellowship. The fellowship is part of the Bobby Jones Scholars program that honors the most outstanding representatives from Emory and the University of St Andrews in Scotland, where Goldfein will study. As AI broke free from abstract theory to everyday reality in recent years, consideration of its ethical implications has lagged. The European Union is at the forefront, just pledging this spring to have guidelines for use of AI by year’s end. So far, many of the alarming AI headlines – such as the facial recognition that helped police spot and arrest a fugitive in a crowd of 50,000 concertgoers in China, and a patent pending to allow Alexa to listen to all conversations – highlight the actions of the people behind the machines. At the current pace of technology, though, it’s not unreasonable to begin questioning the moral responsibility of the computers themselves, says Thomas Flynn, Samuel Candler Dobbs Professor of Philosophy, who oversaw Goldfein’s thesis. The questions are not simply academic. One of Goldfein’s neighbors was in a crash involving an early example of an autonomous vehicle. A driver was test-driving a Mercedes that the salesperson said had the ability to stop itself at a stop sign. It didn’t. Goldfein’s neighbor was injured. The legal system, though, has yet to decide who, or what, was responsible. The driver blamed the salesperson. The salesperson blamed the manufacturer. The manufacturer blamed the computer. At first blush, Goldfein seems an unlikely candidate for considering the moral behavior of AI and the people who design such machines. The Atlanta native and son of two Emory alumni arrived on campus prepared to major in business and theater studies – the fields most likely to be helpful in his goal of becoming a career magician. “I wanted to be the next David Copperfield,” says Goldfein, who was named a “Rising Star” by the Society of American Magicians when he was 16. The spring of his first year at Emory College, his pick for fun was an interdisciplinary philosophy course, the ethics of violence. The course, which included reading “Crime and Punishment” and debated questions such as whether a more brutal death would involve the dull or the sharp end of an ax, was revelatory. Other fields taught him what to think about a certain topic, Goldfein says. Philosophy was about how to think. “He has challenged the ideas of ethics and emotions just as philosophy is reconsidering its old idea that ethical thinking requires only reason,” says Cynthia Willett, Samuel Candler Dobbs Professor of Philosophy, who served on Goldfein’s thesis committee and has taught him in graduate seminars. Goldfein’s work has focused deeply on the high-level steps AI programmers and architects should take, or be removed from, rather than focusing on the programming itself. His research included a year spent as a visiting student at the University of Oxford in England. He studied philosophy, politics and economics, with a focus on analytic and moral philosophy in the St. Peter’s College Visiting Student Programme. Goldfein was also an Undergraduate Honors Fellow at the Fox Center for Humanistic Inquiry. His coursework and honors were not confined to the humanities. Goldfein was Emory’s first Mt. Vernon Fellow, a competitive leadership program in Washington, D.C. He also chose to take neuroscience classes instead of computer science to understand the next level of AI, the “deep learning” that mimics the human brain. Some of the questions of moral sentience – not only if machines could achieve it but also the array of factors that go into it – helped lessen the burden on a programmer to code ethics or virtue into devices, says Andrew Kazama, a lecturer in the Department of Psychology. “From a neuroscience perspective, there are so many things controlling our behavior, from stimuli in our environment to the reinforced learning which machines do now,” says Kazama, who taught Goldfein and served on his thesis committee. “Ben’s thesis is an important piece of writing because it shows there are so many things that scientists are going to have to grapple with, not just the technology, if we want our work to be used for good,” Kazama adds. Goldfein envisions a future working for good and is considering a master’s degree in bioethics, with a career as a lawyer, researcher or academic.